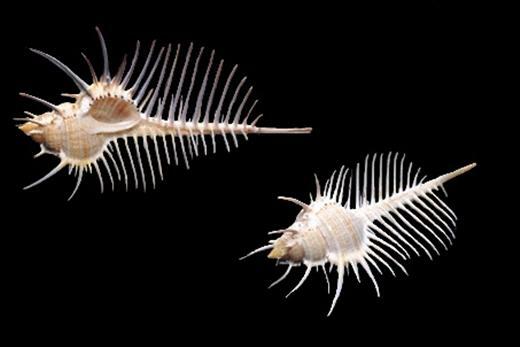 The Venus comb murex, scientific name Murex pecten. They are marine gastropod mollusks in the family Muricidae, the rock snails or murex snails. The shell of this Indo-Pacific species has a very long siphonal canal, and numerous spines; native to Indo-Pacific region. The shell has over one hundred spines, which provide protection from predation, and prevents the snail from sinking in the soft mud. They feed on other mollusks. 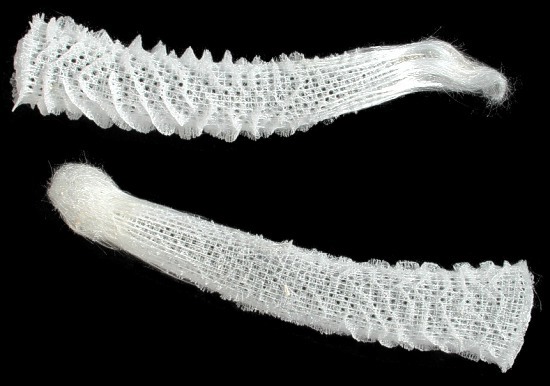 The Venus Flower Basket scientific name Euplectella aspergillum; they are hexactinellid sponges in the phylum Porifera. inhabiting the deep ocean in the Indo-Pacific region. In some Asian cultures, this particular sponge (in a dead, dry state) was given as a wedding gift because the sponge symbiotically houses two small shrimp, a male and a female, who live out their lives inside the sponge. They breed, and when their offspring are tiny, the offspring escape to find a Venus Flower Basket of their own. The shrimp inside of the basket clean it, and in return, the basket provides food for the shrimp by trapping it in its fiberglass-like strands, and then releasing it into the body of the sponge for the shrimp.